There are no standard guidelines for optimal treatment due to the rare incidence of melanoma to the ampulla of Vater. 50-52) Gangliocytic paragangliomas occur predominantly in the second portion of the duodenum and ampulla and show characteristically triphasic cellular components, including epithelioid neuroendocrine cells, schwannian cells, and ganglion cell components (Figure 1, B). Structurally, this spermatophore differed from the microspermatophore in two important respects: the ampulla was about five times the volume of the microspermatophore, and the spermatophore tube was surrounded by abell-shaped structure (Fig. 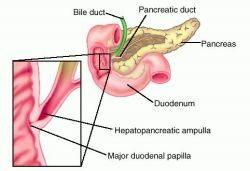 The pancreatic disease group included 42 patients with carcinoma of the exocrine pancreas, 4 patients with adenocarcinomas of the ampulla of Vater, and 6 patients with chronic pancreatitis. ch--chaeta(e), cl--clitellum, dv--dorsal blood vessel, e--egg, i--intestine, mf--male funnel (sperm funnel), mp--male pore, nc--nerve cord, o--ovary, pb--penial bulb, phg--pharyngeal (septal) gland(s), php--pharyngeal pad, s--spermatheca, sc--spermatocytes, spa--spermathecal ampulla, spd--spermathecal duct, spg--glands at the spermathecal pore, t--testis, vd--vas deferens (sperm duct). Expect Bronze Age torcs, medieval chalices, Olympic medals and this 1633 ampulla, which held the anointing oil used during Charles I's coronation. Suprasquamal ridge bare; greater ampulla bare; 3 species . The tubes were flushed by gently grasping the tubal ampulla near the fimbrial portion with an atraumatic tubal forceps and introducing an epidural catheter (BD Perisafe I[R]--Mexico, Cal. 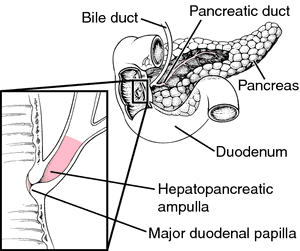 Fructose is also an androgen-dependent secretion emanating mainly from the seminal vesicles, with a small contribution from the epithelial cell of the secretory epithelium in the ampulla of the vas deferens. Also at the exhibit are inscribed slates discovered at Strata Florida Abbey in mid-Wales, one with the faint medieval scribblings of a poem in Welsh and the other marked with notes made by a 15th Century rent collector while taking payments from the tenants of the abbey There is also a holy water bottle, known as an ampulla, which is decorated with imagery connected to the martyrdom of Thomas Becket.